It was no secret that Ford Motor Company was testing the 2013 Shelby GT500 Mustang last year and after those spy shots hit the web, many expected that a release would be issued in the weeks following with lap times for the supercharged pony car. However, that release never came and GT500 lap times became a major discussion point across the online Mustang community but there was still no word from Ford – until now. 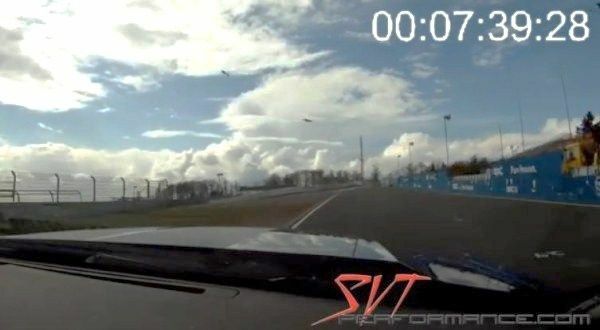 The video below surfaced via the folks at SVTPerformance.com and it shows what appears to be the 2013 Shelby GT500 Mustang in action on the Nürburgring Nordschleife. There is also a handy timer displayed in the top right corner and as the 662 horsepower Mustang crossed the finish line, the timer stops at 7:39.28. Now, that time hasn’t been made official by Ford (or anyone else) but a time of 7:39.28 makes the 2013 and 2014 Ford Shelby GT500 Mustang quicker around the Nürburgring than the 2013 Chevrolet Camaro ZL1 to which it is most often compared. Back in October 2011, GM test driver Aaron Link lapped the Ring in a 2012 Camaro ZL1 in 7:41.27 so when compared to the GT500 time displayed in the video below, the GT500 is about 2 seconds quicker than the ZL1 on the most grueling road course in the world. While this is cause for Ford and Mustang fans alike to rejoice, they shouldn’t be too quick to claim the Shelby GT500 Mustang as the greatest muscle car ever. While it is the most powerful factory built and street legal muscle car ever with 662 horsepower, the time of 7:39.28 on the Nürburgring Nordschleife is 1.81 seconds short of the time recorded by the 2014 Chevrolet Camaro Z/28 earlier this month of 7:37.47. That time by the new Camaro Z/28 makes it the fastest muscle car to ever lap the Ring and it should come as a huge surprise considering that the Z/28 is stripped out and designed specifically for road racing. Most impressively, that run was made in the rain so another trip to Germany for some high speed testing with dry conditions could yield even better times but with an unofficial time of 7:39.28 – the GT500 seemingly claims another small battle with its arch nemesis…the Chevrolet Camaro ZL1. What we have to wonder if why Ford didn’t issue this video and announce this 7:39.28 lap time previously. Provided that this video was captured between November 2011 and September 2013, Ford would have been able to brag about the 2013 GT500 Mustang being the fastest muscle car to ever tackle the Nürburgring Nordschleife and Ford would have held that title until earlier this month when the Camaro Z/28 ran its 7:37 in the rain. There is the possibility that Ford wasn’t happy with this time – even though the GT500 beat the ZL1 – so they didn’t bother to make a big fuss about the record run. There is also the possibility that there was some question about the timing system so Ford opted not to make an official claim without pinpoint accuracy. In any case, the 2014 Chevrolet Camaro Z/28 continues to hold the record for being the fastest American muscle car around the Nürburgring but if these times should become official, the 2013 Ford Shelby GT500 Mustang has one more piece of the puzzle that helps to make it the best muscle car on sale in America today. The Z/28 might be faster on the Nürburgring but when compared to the similarly loaded up ZL1 – the GT500 is the king of the muscle car hill. Hmmm, guys you know if you read the source of where this video came from, you'll discover that it was just a video, and a fan ADDED the timestamp to it. So while that 7.39 may be close, it is not actually correct. This is not even close to official...its fan made. I understand that...I thought that I was quite clear that it is not an official time. Great article. Makes me feel all fuzzy all over about my 2014 GT500!